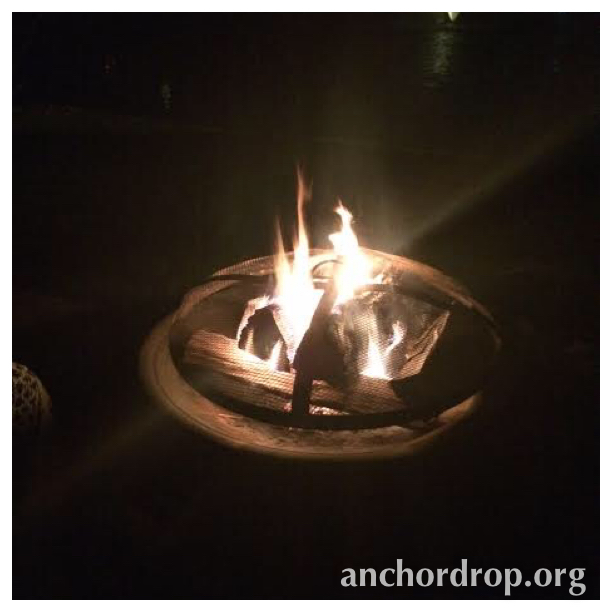 Pumpkins, gourds and chevron…oh my! I love Fall. It is the season that reminds me most that I am alive. This is odd, I realize, as it is a season of leaves dying and the earth preparing to go into hibernation. The crisp air encourages my lungs to breathe deep. 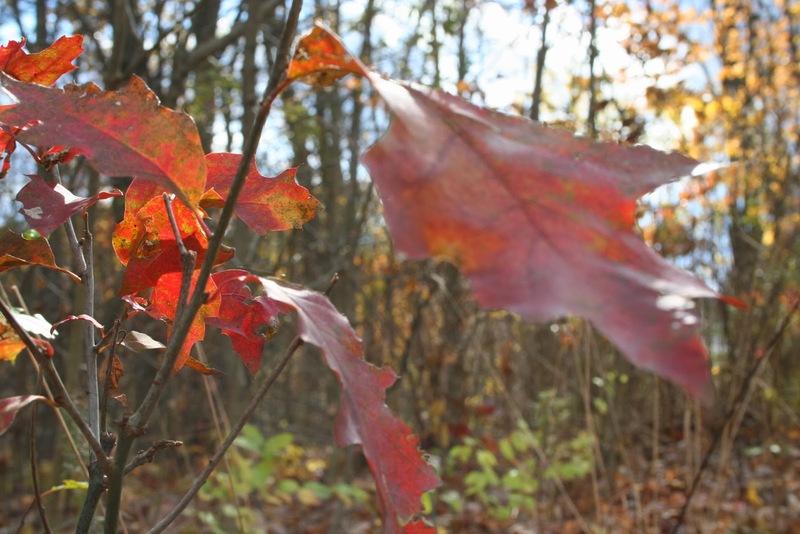 Color explodes on the branches of trees and swirls around me as the wind blows and the leaves fall. My eyes drink in the beauty of creation and my senses are shocked with the contrast of Fall to the past months of Summer. Throughout the year, I have to fight the urge to wear fall outfits. I like being seasonally appropriate in my attire, but I’m always drawn to my leather cowgirlish boots and brown articles of clothing. Eagerly, I anticipate a time when it is seasonally appropriate to bust out the leather boots, knit socks, jeans and, puffy vests and plaid shirts. Must be the Indiana girl in me. The crispness in the air, the burst of flaming leaves, the lure of apple orchards and pumpkin patches…sign me up for that! Fall also has a way of transporting me through time to some of my favorite memories. Traditionally, I will reminisce about Ireland when the wind blows a certain way and sidewalks have crisp leaves on them. I lived in a 100yr+ YWCA for a semester that was a block from the Irish Sea. The coastal breeze and seasonal coolness “forced” me (I didn’t protest too much!) into wool sweaters and jeans and I spent many days curled up in the yard with my books and a quilt. I find myself yearning for those scenes to be replicated…so, I pack up a bag and head to my second favorite place…Geneva, IL. Geneva is a little town, west of Chicago by about an hour, and along the Fox River. My desire to enjoy the weather, soak up the reminder that life is happening through the changes in the season, bring me to my favorite coffee shop for a dirty chai tea latte, and then down by the river. The fall foliage is beautiful and the feeling of being wrapped up in a comfy sweater while enjoying it, well…that’s definitely one of my favorite things. Where are some of your favorite places to visit in the fall? Fill us in so we can add to our lists of places to go and things to do! 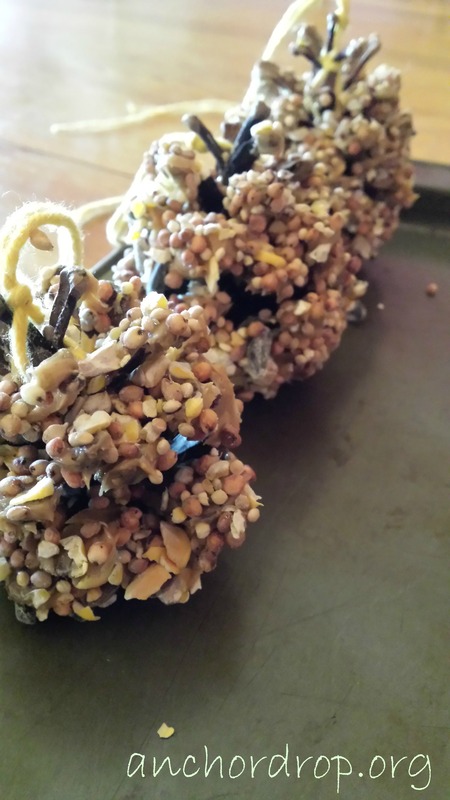 DIY Bird Feeder: So easy, a Toddler can do it! It’s that time of year again; time to break out the pumpkin spices and pie pans and decorate your porch with pumpkins. I love fall. I really do. If it was up to me, I would have only fall and summer as seasons. Along with fall, comes many fun crafts that you can do with your kids. My daughter is a couple of months away from turning 2 so I have to get creative when I think about what her skill level is right now. Today, we made some fun little bird feeders! 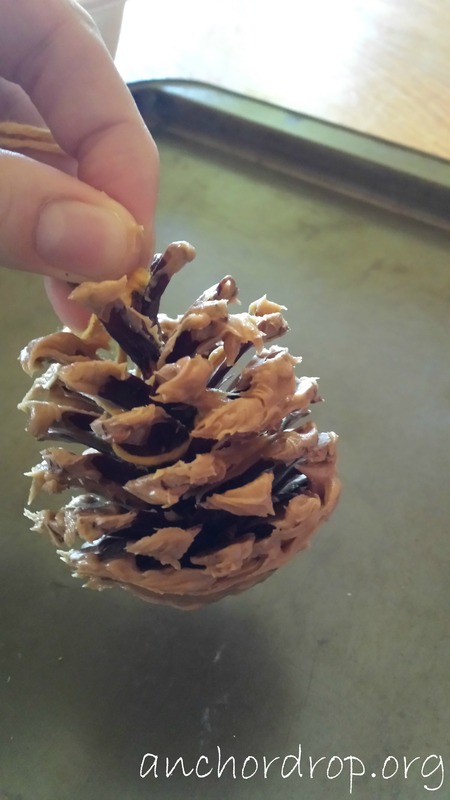 First thing you want to do is cut a length or your yarn or twine and attach it to the pine cone. I intertwined it and tied a knot using the middle of my twine and left the two ends open for when we hang it in a tree. 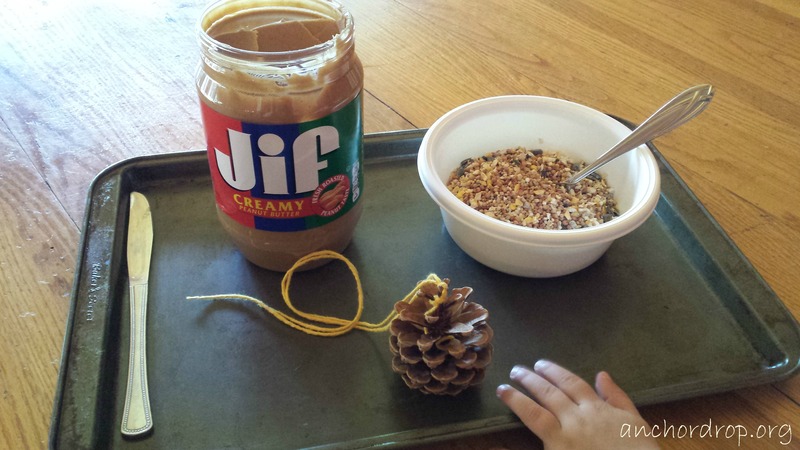 Then spread peanut butter onto the pine cone. 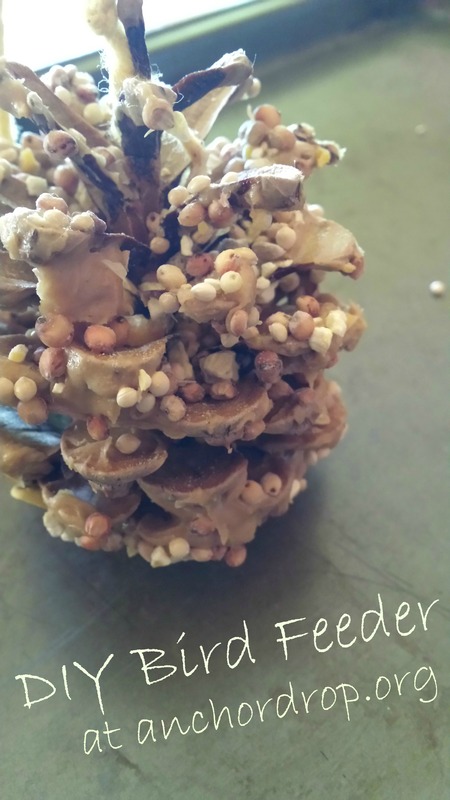 After we were done and my daughter had difficulty spreading the peanut butter, my mother-in-law had a great idea: warm up the peanut butter and then have your child dip the cone into it! Or roll it in a pan! Genius! So that’s definitely on my “next time” list for this craft.